View of the Royal Academy of Arts, which in 1781 was housed in Somerset House. Somerset House was a former Royal Palace, which was rebuilt in 17 by architect William Chambers (Chambers was also the first Treasurer of the Royal Academy). The Royal Academy of Arts was founded in 1768 under the patronage and protection of George III. Its purposes were to hold exhibitions of fine art and also an art school for students to learn. It was allocated some large rooms on the Strand front of Somerset House, which allowed it to display 600-700 paintings. 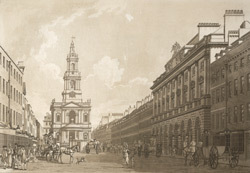 Also seen in this view is St Mary Le Strand, in the middle of the street. This small Baroque church was one of the first to be built under the Fifty Church Act of 1711. It was designed by James Gibbs and built between 1714-17.